As part of Pocket Utopia’s ongoing “Social Saturday” series, I will screen video documentation of my interactive crosswalks on May 24th from 4:00 to 6:00 pm. In addition I will also screen video and sound art by a few local artists featuring crosswalks and area street life; as well as entertaining internet clips dealing with crosswalks and pedestrian challenges. 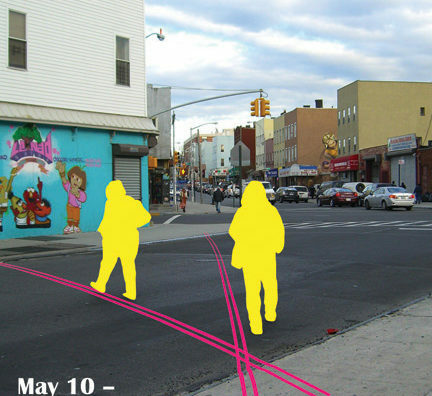 The “Visionary Crosswalks Social Saturday” will be an opportunity to watch videos, hang-out, and foster discourse on the Bushwick pedestrian experience. Pocket Utopia is an away-from center, off-center, exhibition, salon and social space run by artist Austin Thomas. Pocket Utopia is pleased to present it’s second neighborhood public art project: Visionary Crosswalks by artist Graham Coreil-Allen. 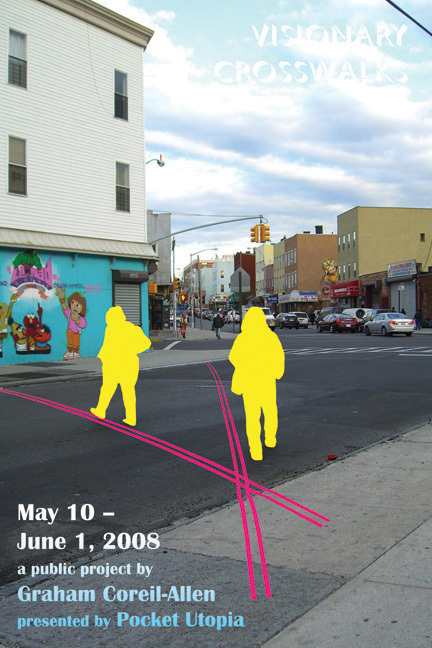 Presented in-situ, Visionary Crosswalks will be a series of interactive crosswalk installations throughout Bushwick. Graham Coreil-Allen will create five temporary “crosswalks” demonstrating some of the casual paths that pedestrians take when navigating various intersections in the northwest section of Bushwick. Coreil-Allen will also install interactive posters around the crosswalk sites and other locations. The posters will consist of a neighborhood map with a detail of particular intersections, and will posit this question: “How did you get here?” and “How did you cross the street?”. Each map will also include a marking pen so that passers-by may answer the questions. Coreil-Allen will periodically collect these maps and use the participants responses as plans for installing additional crosswalks. As part of Pocket Utopia’s ongoing “Social Saturday” series, Coreil-Allen will screen a video documenting the crosswalk footage on May 24th from 4:00 pm. 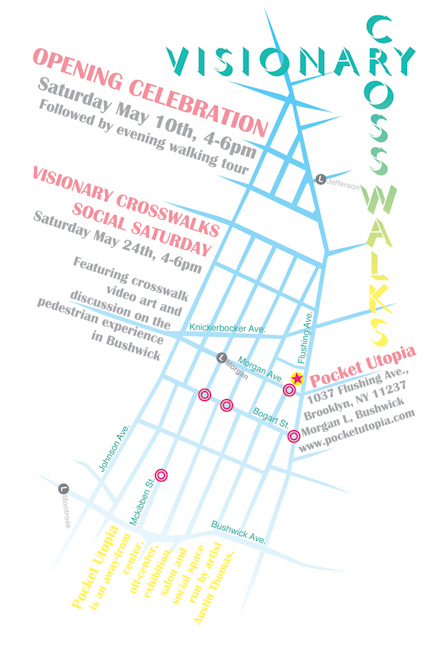 The “Visionary Crosswalks Social Saturday” will be a fun and casual opportunity to watch videos, hang-out, and foster discourse on the pedestrian experience in Bushwick. 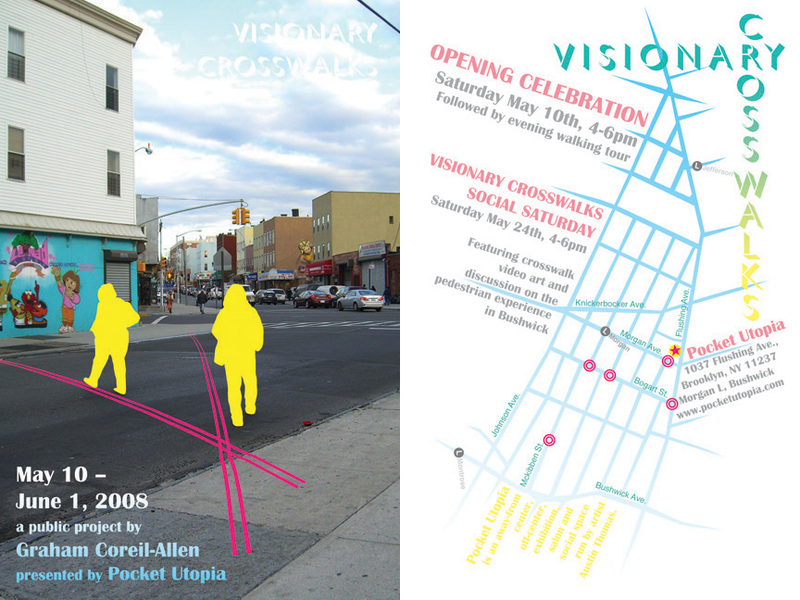 Interested participants can find maps and installation locations for Visionary Crosswalks at Pocket Utopia. 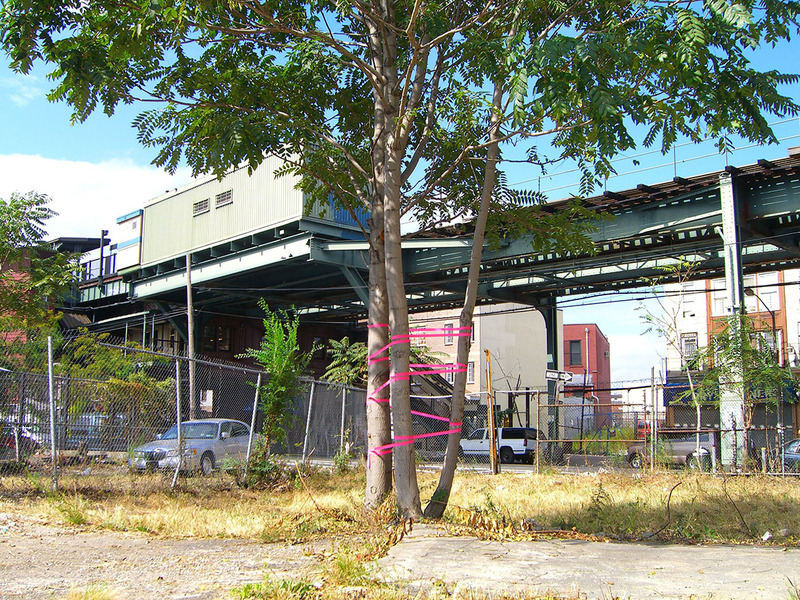 New Public Sites – Bushwick, is a collection of four site-specific installations located in appropriated “public” spaces in Bushwick. The sites differ from traditional public spaces in that they are privately owned and have fallen into various forms of “disuse”. The installations consist primarily of subtle incursions of surveyors tape. Gestures of bright pink lines suggest possible paths or points of focus. 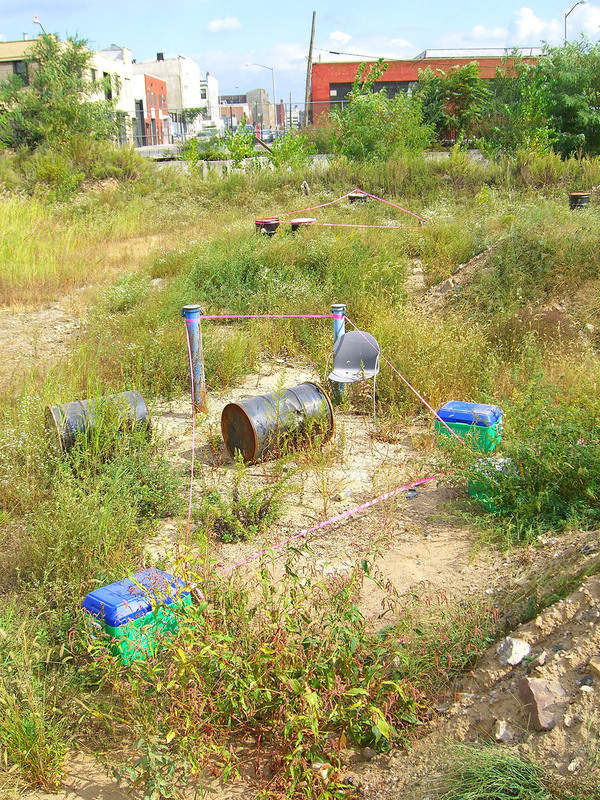 Participants are invited to investigate each site with caution and curiosity. Explore at your own risk. Between Mckibben St., Bogart St., and Boerum St.. Entrance on Boerum, next to concrete plant. “Rooms” marked in central field. 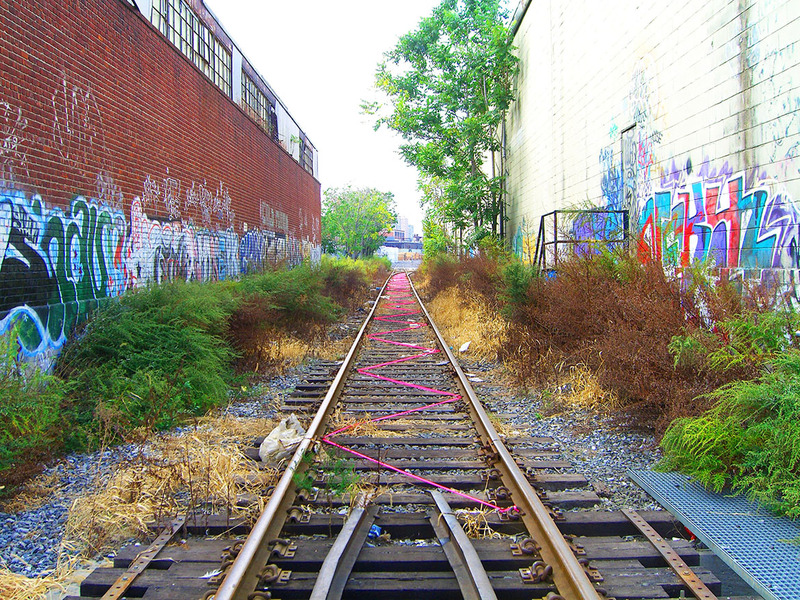 Rail road tracks between Morgan Ave. and New Town Creek. Entrance on Morgan Ave., between Johnson Ave. and Meserole St., heading east. Between Myrtle Ave. and Dekalb Ave., South of Central Ave. M station. Entrances on Myrtle Ave. and Dekalb Ave. Trees tied together as pivoting point. 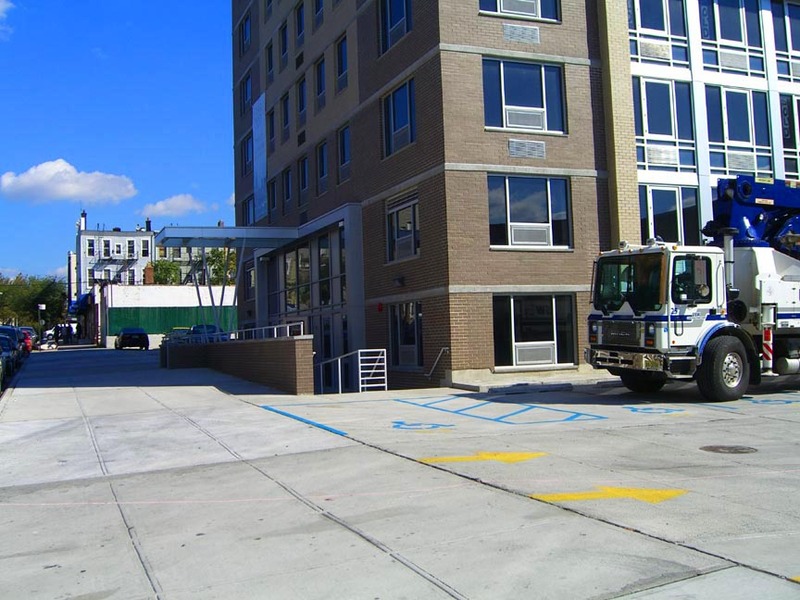 358 Grove St. parking lot, between Irving Ave. and Wyckoff Ave.